1.2 What Is Exactly Meant by “Bilingualism”? With special thanks to my family, my boyfriend and, of course, my supervisor. Due to the fact that more and more people migrate or have partners of other languages these days, many children are brought up with two or even more languages. This phenomenon is also known as bilingualism (or multilingualism). For a very long time, people believed that this phenomenon would have a negative and decelerating effect on the child’s first language acquisition and overall development (Genesee, 2008: p.65/Grosjean, 2010: p.179). Bilingualism was long thought to be an “oddity or abnormality” (Meisel, 2001: p.12). But as research has shown in the last decades, bilingualism is anything but negative (Cummins, 1976: p.2/Auer/Wei, 2007: p.165). Particularly in the field of neurolinguistics, many positive effects of bilingualism have already been shown, for example in fields like problem solving or attention tasks (Grosjean, 2010: pp. 223-224/Karbalaei, 2010: p.275). Not only has it been proven that bilingually raised children really develop their language abilities in an almost analogous way like their monolingual peers (Genesee, 2008: p.73), it is also obvious that children growing up with two or more languages have special opportunities in their future. Since foreign languages are not only needed in school nowadays, but also play a very important role in the field of employment – e.g. in tourism, business or marketing – being raised bilingually seems to be advantageous by all means. What is more, children are frequently confronted with foreign languages in the new media nowadays. The internet provides the opportunity to surf on web pages from all over the world. So, the more languages one is able to master, the more possibilities one has to get hold of information. Here it plays a prominent role, however, whether bilinguals can only understand their second or third language or if they are also able to communicate with it, to wit speaking or even writing or reading in the second or third language. But before we come back to this crucial feature of bilingualism in chapter 2 (Theoretical Background of Bilingualism), the term bilingualism itself will be briefly defined and explained initially, followed by a short statement about the choice of bilingualism as the topic of this paper. Additionally, the family used for my study and their special situation will be introduced and a short outline of the paper will be given. The term ‘bilingualism’ has several definitions and levels of meaning. On the one hand, it occurs in the context of impersonal coherencies such as bilingual schools, bilingual toys or bilingual dictionaries. On the other hand, bilingualism is to be found in relation to humans. It can either be related to the context of a whole community using two or more languages or it denotes a single human’s ability “to use two or more languages […] in their everyday lives” (Grosjean, 2010: p.4/Baker, 1996: p.5). One could argue whether the term bilingualism does not only refer to people who are able to use ‘just’ two languages – referring back to the Latin origin of the word, consisting of ‘bis’, meaning twice and ‘lingua’, meaning tongue or language. People who are able to use more than two languages, should hence be called ‘multilinguals’. But as the term bilingualism is used more often and even in linguistic research it denotes people using two or more languages (Grosjean, 2010: p.4), it will be used in this paper for both “real” bilingualism and multilingualism at the same time. Of course, there is no absolute definition of being bilingual or not. There are various gradations of bilingualism (Kessler, 1984: p.27). But this relatively complex subdivision will be explained in detail in section 2.2 – Categorization of Bilinguals. As a matter of fact, I have been interested in this topic for quite a while already. Even if I personally do not have any experience with bilingualism myself – except for the fact that I am studying English Education and have spent half a year in the U.S. in a semester abroad program – there is bilingualism in my environment. A couple I am closely acquainted with raises their children bilingually English and German, even though neither of the parents is an English mother-tongue. The mother has already spent more than two years in English speaking countries and is therefore a very proficient speaker of the English language. She is the one talking in English, while the children’s father is talking in German to their children. It has always fascinated me that the children seemed to have been able to understand the two languages simultaneously from the very beginning on, when they were still not even able to “produce” language by themselves. Moreover, the fact that the children spoke English and German when they spent a year in the U.S., but now they do not speak English anymore – they subconsciously even refuse to speak English – was even more interesting. I read upon bilingualism and got more and more excited about it. Finally, I held a presentation in an advanced linguistics seminar and that is when and why I decided to write my state exam thesis about this topic and with this family. After having stated the reasons for choosing bilingualism as my topic, the family used for my study shall now be introduced. It consists of the two parents, married and living together – which is not implicit nowadays – and their three children. The mother of the family is 44 and her husband is 41. Both of them are native Germans, but the mother only speaks English with the children, while the father speaks German, respectively German with a Bavarian, Upper Palatinate accent. When the couple talks to each other, they both speak German with a Bavarian accent, as to relatives and acquaintances (except for one acquainted couple who also raises their children bilingually German and English, but whose children are attending an international school). The reason why the mother is talking English to the children is the following: The couple has lived in London for one year, seven weeks after the eldest son (12;6 and called Son1 in the following), was born and that is when the mother first started to speak English with her firstborn. She continued to do so when they returned to Germany. Thus, she produced ‘unnatural bilingualism’ – speaking English without being a native English speaker. Nevertheless, some of Son1’s first words were then even English, e.g. when the mother (or anybody else) was holding keys in her hands, he always said ‘keys’. With five years of age, Son1 spent a year in the U.S, where he attended elementary school. One has to add here that the mother had already spent two years in the U.S. beforehand, one time six months as an au pair girl after school in Atlanta, Georgia and the other time together with the father in Austin, Texas for one year. So she is actually a German mother-tongue, but she is also a very proficient speaker of the English language, respectively the American English language. She only reads English books and if there is the possibility, she also watches movies in the original version and tries to keep up to date with the language as well as possible. She learned to speak the American English accent first and that is what she has maintained, even though she lived in London for a year. The other two children, a daughter (10;3) and another son (8;1 and referred to as Son2) have also already spent a year in an English speaking country, namely the U.S., when they were 3 and 1 year old, respectively. The father worked at Stanford University for one year and that is why the whole family was living in California. There, Son2 was still too young to speak, but in contrast, the daughter started to speak English very soon and did not even speak much German anymore. Not even when she talked to her German grandparents on Skype© did she speak German, even though the father never stopped speaking German to his children. As the daughter visited pre-school three times a week, her environment was predominantly English and she simply adjusted to it. And according to Grosjean (2010), it is quite typical that children adjust themselves to their environment and the necessity of language (see figure on p.13). Since the family has come back from the U.S., they have moved three times within Germany so far. First, they were living in a town next to Bonn, when they came back from the States, where they had already lived before they left Germany. After three years they moved to a town next to Heidelberg in Baden-Wuerttemberg and stayed there for three and a half years. Last year, the father got a new job in Bavaria and that is why the family moved again, this time to a town in this federal state. So, the three children were not only confronted with the two different languages American English and German, but also exposed to different dialects of German, namely High German mixed with Cologne, Baden and Bavarian. 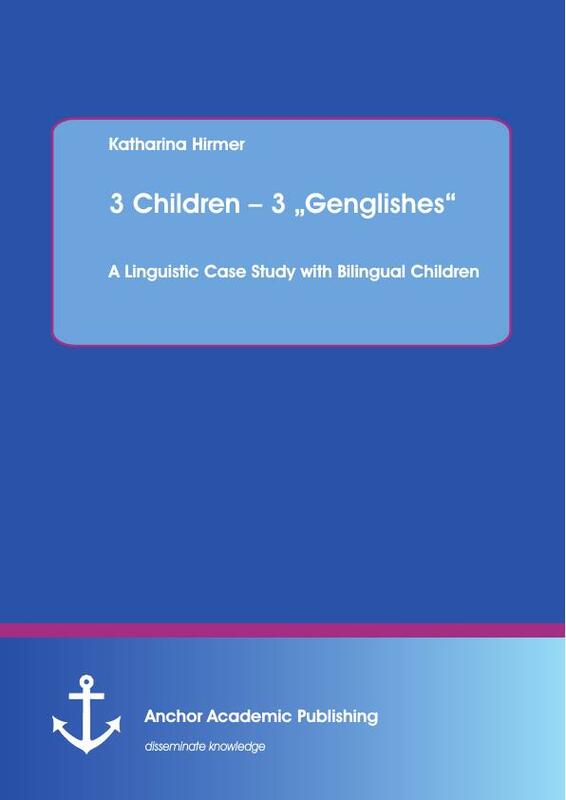 Therefore, according to Grosjean’s definition of bilingualism (2010: p.4), these three children are hence definitely bilingual, no matter which abilities they have in English and German. What should be considered here as well is that the two boys had a hard time getting into the Bavarian school system. When the family was still in Heidelberg, Son2 had not such huge problems in school (except for slight, but yet undiagnosed dyslexia due to genetically determined difficulties in hearing and seeing). But here in Bavaria, he had to go back to first grade after five months in second grade, because he was not able to cope with the tasks in time, particularly in German lessons. Mathematics is, for example, no problem for him at all. One has to add here that Son2 also started to speak very late. Perhaps it was the wrong time for him to come back from the U.S. and live in a completely German environment, but on the other hand, this hypothesis cannot really be proven. After all, Son2 has attended speech therapists regularly since he was three and this has already helped him a lot. The logopaedic treatment had been interrupted for a short time, but because of his problems in school, he is now doing speech therapy again. Son1 even had to change the type of school. Back in Baden-Wuerttemberg, he had attended Realschule with average performance. Here in Bavaria, however, he was not able to keep up with the Bavarian Realschule at all and that is why he switched to Mittelschule after Christmas break, which has had only positive effects until now. He did not have only good grades in his last annual report, but he managed the progression to the next grade. The daughter is the only one who does not have problems with the Bavarian school system at the moment. She had got above-average grades in fourth grade and even attends Gymnasium now since September. 1) Which type of bilinguals are the three children according to the possibilities of categorization given in 2.1? 2) Do they use code-mixing and interferences (these terms will be explained in section 2) even though they do not even use the English language in their daily lives (except for usage in school)? 3) Does the fact that their mother produces ‘unnatural bilingualism’ contribute to the children’s attitude of denial towards the usage of the English language? 4) Are the problems the children have in school related to the fact that they have been raised bilingually? These questions are to be clarified in the course of this paper including theoretical background and practical examples. First of all, a general overview about the theoretical background of bilingualism will be given. Important sub items of this chapter will be the current status of research, the ways in which bilinguals can be categorized, the ‘one person – one language principle’ and interferences and code-mixing as important components of bilingualism. In the next chapter, the case study will be presented. Here, the aims, methodology and materials of the study will be described. Subsequently, the results of the case study will be brought into relation with the underlying linguistic theory. At the end of the paper, the four questions will be answered and further implications of bilingual language acquisition will be made. As already mentioned in the introductory part, bilingualism has been quite an active research area in the last decades (Meisel, 2001: p.11). Started off by Ronjat in 1913 (Meisel, 2001: p.11) and the landmark study of the American linguist Werner Leopold about his two daughters, (Pressley/McCormick, 2007: pp.207-208), no other ground-breaking results have been detected – only works being very general – until the late 1980’s (Cenoz/Genesee, 2001: p.1). Only then, more and more researchers became interested in bilingual language acquisition again due to the fact that also more and more children and adults were becoming bilingual for reasons already mentioned in the introduction: migration, international partnerships etc. Bilingualism had arrived on the screen again and still today, many linguists devote themselves to the study of bilingualism in most diverse subcategories. Children growing up bilingually have often been compared to their monolingual peers concerning differences in their language acquisition processes. In so doing, it turned out that “when looking beyond specific instances […] and focusing on the major developmental stages, there are no significant differences between monolingual and bilingual children” (Genesee, 2008: p.73). 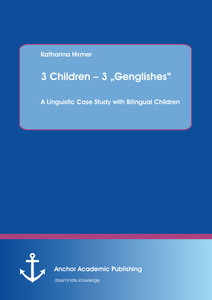 Also Grosjean (2000) supports this thesis by stating “One should keep in mind that bilingual children, because they have to deal with two or more languages, are different in some ways from monololingual children, but definitely not on rate on language acquisitision.” Other linguistic studies put their focus on the development of morphology, syntax and phonology within bilingual children or on the way parents interact with their children. Moreover, the effects of and reasons for language mixing or the question whether bilingual children work with one language system or two systems – independent of each other – from the very beginning on were examined. Referring to the latter, there have been two different hypotheses concerning this matter: The “Unitary Language System Hypothesis” given by Volterra and Taeschner in 1978 and the “Dual Language System Hypothesis” by Fred Genesee in 1989. Current research still cannot prove that the “Unitary Language System Hypothesis” is wrong. But at the moment, there are strong tendencies towards the “Dual Language System Hypothesis”, since “if the Unitary Language System Hypothesis is correct, then we would expect bilingual children’s early language productions to be quite different from productions of monolingual children acquiring either language” (Genesee, 2008: p.68) and it has already been proven that there are no huge differences between monolingual and bilingual language acquisition processes (see above). And that is why research mainly supports the Dual Language System Hypothesis (Genesee, 2008, p.68). Present studies, however, already go beyond this kind of differentiation when scrutinizing bilingual children (Cenoz/Genesee, 2001: p.3). But most of them concentrate on bilingual language acquisition in its early stages, least of them deal with later ‘consequences’ of bilingualism with children at school age. In addition to the already mentioned linguists Volterra and Taeschner, Fred Genesee and Jürgen M. Meisel, Francois Grosjean, Colin Baker, and Ellen Bialystok should be mentioned here as well. Those linguists are some of the world’s leading researchers in the field of multilingualism nowadays and that is why they are worth mentioning in person. For many people, bilinguals are all people who are able to speak two or more languages native-like, but bilingualism does not only denote people who are perfect speakers of two (or more) languages. There are most diverse gradations of bilingualism, but there is no real consensus in research on how various situations of acquiring two or more languages at the same time can be categorized. Bilingual language acquisition processes can either be categorized by the age of the speaker, by his/her skills in the two languages, the representation of the languages in his/her mind or by his/her cultural affinities, all of which will be explained in the following. Related to bilingual children, the denomination ‘successive bilingualism’ is normally used for children who acquire their second language from the age of 4 or 5 on until the age of 11 or 12 (Hammer, 1999: p.17). This group can once again be subdivided into early and late L2 acquisition (Montrul, 2008: p-18). Passive bilinguals are (almost) native speakers in one language, while they are only capable to understand their second language. Virtually, this is the minimal requirement for bilingualism, but it plays a prominent role in the following case study (see section 3.3) and therefore it has to be mentioned in particular. Dominant bilinguals are more proficient in one of their two languages (Baker, 1996: p.8). This is the case with most bilinguals (Hammer, 1999: p.19). Usually, bilingual children have one ‘weak’ and one ‘strong’ language. In their ‘weak’ language, they normally have troubles finding the right words and use code-mixing or code-switching more often than in their ‘strong’ language. The ‘strong’ language is the dominant language (Genesee, 2008: 80), but depending on the situation a child lives in, this dominance can also shift. Especially when the environment of a child is heavily dominant in one language and the second language is not supported well enough or not really needed anymore, children are even prone to no longer use one of the two languages (Grosjean, 2010: p.172). The following figure is very helpful to understand the coherences of special factors in the acquisition or maintenance process of languages within a bilingual child. Here, the common prejudices that bilingual children do not learn their two languages properly and that they are stutterers (Kielhöfer/Jonekeit, 2002: p.10), come into play. Due to the fact that bilinguals most of the time do have a ‘weak’ and a ‘strong’ language, they certainly show some deficiencies in their nondominant language But usually, as soon as they are exposed to their ‘weak’ language, e.g. when they are on vacation in a country where this language is spoken exclusively, they will certainly master their nondominant language well enough to use it as a means of communication If this exposure endures for a longer time, even the ‘weak’ language can eventually become stronger. Of course, there are children who follow the prejudices of stuttering and not being able to use their ‘weak’ language properly. But with these children, there has to be either a break within the principles of bilingual parenting or they suffer from speech impediments anyway. (Kielhöfer/Jonekeit, 2002: pp. 90-91). Grosjean would also call teaching a foreign language a special form of bilingualism (2010: 146ff. ), based on his definition of bilingualism on p.4, which does not necessarily imply that only children can be bilinguals. 12;6 means that he was 12 years and 6 months at the time I surveyed the family. The same applies to the other two children. 10;3 means 10 years and 3 months, 8;1 means 8 years and 1 month. There is, of course, a huge amount of further researchers in the field of bilingualism, but as it would go beyond the scope of this paper mentioning them all, name by name, I have included some of them in the rest of the paper, but certainly not all. For a survey see “The Handbook of Bilingualism”.